Kolkata: Rain or sun does not bother them, neither does the cacophonous traffic nor the incessant clamour of a packed city. Their dream is to get World champion Vishwanathan Anand to visit their "club", the concrete railing under a busy flyover where a clutch of chess aficionados concentrate on games over which rulers once traded kingdoms. For the 80-odd members of the Gariahat Chess Club, the love for the game transcends everything else - weather, traffic, crowds - as masters and novices come together to play the game of kings right under the busy 570-metre-long Gariahat flyover in south Kolkata. "I've been playing chess here since my childhood, even before the flyover was constructed. This area was our favourite meeting place. As more and more people joined us and some even ventured out to participate and win prizes in various tournaments, an idea began to take shape - that we should form a club," Gariahat Chess Club president Debashish Basu told IANS. However, despite attempts spread over months, no closed space could be found. Finally, the love and passion for the game catalysed the motley group in November 2006 to give birth to the club on an an open space under the flyover. The club now boasts of at least 80 members, who sit on concrete railing where the chessboards are also placed. "For me and other members of the club, all the noise does not affect us. If you have the passion, nothing can bother you," Basu said. The chess club has one aim - to promote the game of chess - and their mission is to organise a tournament every month. From retired pensioners to school and college goers, from bankers to professionals - all make a beeline to the Gariahat Boulevard waiting for their turn to play the cerebral game. But how does one concentrate, in the chaos of the traffic and the clamour of the hawkers and commuters, on a game which demands tremendous mental attention? "We have been playing here for years and nothing - be it the weather or the noise - has ever affected us. When a game is played we transcend to a different world where the only things visible are the 64 squares and the pieces on them," Sandip Mazumdar, for whom a day is never complete without a game of chess, told IANS. "It would be wrong to say they do not get disturbed by the surrounding noise and cacophony. Initially it surely is difficult for them but as time passes they get habituated," said Sabyasachi Mazumdar, a clinical psychologist. "On the contrary, those who have been playing there regularly might find it difficult to concentrate when playing at a secluded and calm place," Mazumdar added. The Gariahat Chess Club, a constant source of inspiration for budding chess players, is making an effort to invite five-times World champion Viswanathan Anand to their club. "It has been our dream to bring Anand to our club, especially now when he has retained the world crown. We are trying all out to bring him. If he comes it will be a dream come true for us," added Basu. 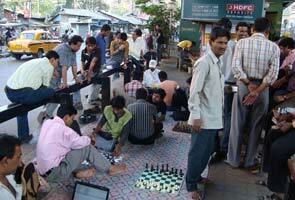 Though one may find it amusing to see people playing the game on the street in India, street chess is popular outside the country, especially in Russia and the US, as also in Europe. In the town of Ravna Gora in Croatia there is even a "Chess Street" because of its regular street chess events. Chess hustling, as street chess is known in the West, has been around for many years, with the spring being the most popular season for the game.